The Prayer of the Oppressed event began with an Arabic prayer recited by Dr. Ali Yurtsever then an English translation was read collectively by prayer participants. The prayer called for an end to systemic violence and oppression and God’s mercy to envelop all of creation. After the prayer, three panelists, Chaplain Khalid Bilal, Anna Lloyd, and Zaynab Shahrar, spoke on various manifestations of systemic racism, including the prison industrial complex, white privilege, police brutality, the intersection of Islamophobia and anti-blackness with a sincere and lively Q and A session that followed. It was an honest discussion with thought-provoking points. 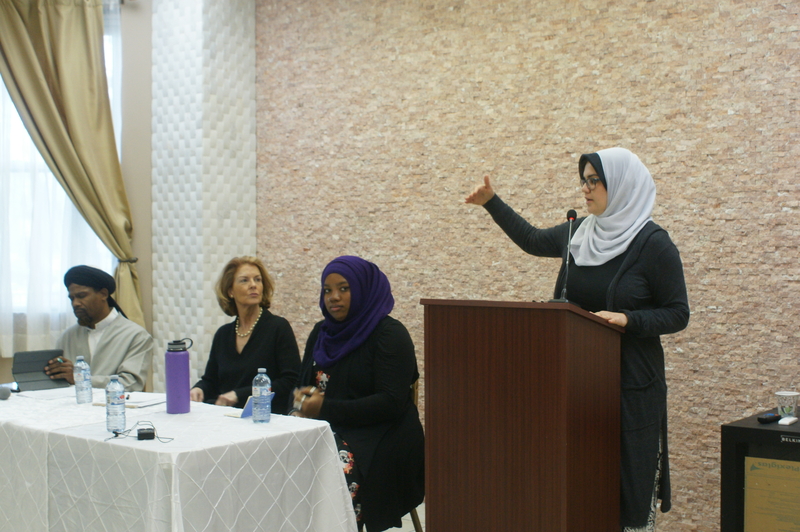 Calls to action for awareness of these societal ills were made by all participants, in addition to an invitation by Anna Lloyd to attend an interfaith dialogue on racism sponsored by the Interfaith Coalition Against Racism on June 12 in Hyde Park, Chicago. Thank you to all the panelists for their critical insight and thank you to our co-sponsors: the Muslim Student Association of the University of Chicago, Jewish Council on Urban Affairs, and Sirat Chicago. Zaynab Shahar is an aspiring the@logian, writer, and interfaith activist. A future doctoral candidate at Chicago Theological Seminary, she received her bachelors in Jewish Studies from Hampshire College (2013) and her Masters in Religious Studies from Chicago Theological Seminary (May 2016). Her research focuses on rhetorical constructions of gender and communal ritual within public religious space within religious law and their impact on current movements for women’s religious leadership in Jewish and Muslim American communities. She also maintains specializations in Jewish gender studies, historical anti-Semitism, theopoetics, and comparative mysticisms. Outside of academia she maintains a foot in the world of cultural work and interfaith activism. She has represented Muslims in an interfaith capacity at Creating Change 2016, the 2015 North American Interfaith Network conference as a youth scholar, and the 2015 Muslim-Jewish Conference in Berlin. Recently teaching the organization management module for the McCormick Theological Seminary’s executive leadership institute, Anna Lloyd is a 25-year veteran of executive management, social entrepreneurship and higher education consulting. Committed to the redesign of integrative institutions, she has launched the first Chicago RoundTable for Gen X leaders seeking to practice holistically in financial, marketing and social services, on behalf of Seeing Things Whole, nationally. The integration of business objectives with social impact has facilitated her serving as Founding Executive Director for the Center for Integrative Leadership, University of Minnesota, after completing eight years as CEO for the national Committee of 200 (C200), and C200 Foundation, the international women’s business organization featuring entrepreneurship among women. Signature research included Teens on Business, a collaboration with the Simmons School of Management. The recent collaboration with McCormick deepens personal objectives as sector boundaries disappear among organization research, management and spirituality. Trained in New York City economic policy, serving as a vice president in the city’s Financial Services Corporation, Lloyd then directed the C200 national foundation and membership organization for women executives and entrepreneurs for over eight years, designing and launching education initiatives with business and policy schools, corporations and elected officials. As Founding Director for the Center for Integrative Leadership, a multi sector and university wide leadership research and practice center, she attracted faculty and donors and anchored a multidisciplinary approach to classroom and online teaching that launched both case studies and corporate leadership training tools. Lloyd believes that most organizations can manage to re boot and remain relevant. She is co-founder of the Chicago-based Interfaith Coalition Against Racism.